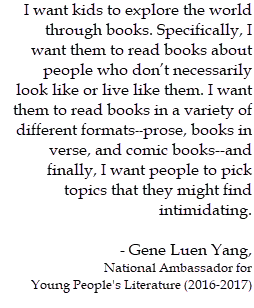 At the heart of the NCBLA’s mission is our goal to encourage all young people across the United States—all boys and all girls—to become lifelong readers, proficient writers, and deft communicators. And though we aim to inspire our kids to read widely, we understand that many boys favor reading action-packed graphic novels and nonfiction, whereas many girls tend to enjoy more character-driven fiction. As adults who live and work with young people, how do we get our kids to read as much as possible, to try new books, and to hone their writing skills? 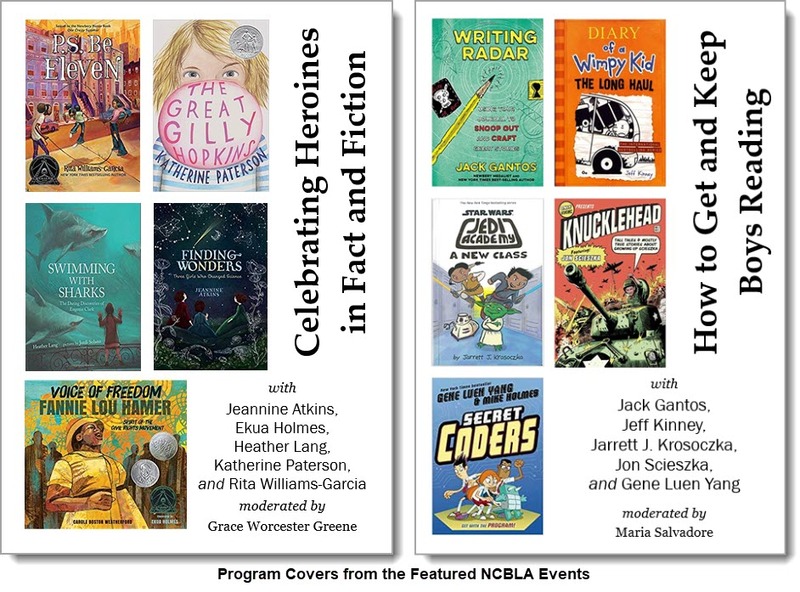 With these questions in mind, the NCBLA gathered two star-studded panels of authors and illustrators for young people in 2017 to dig deeply into these topics and to discuss and brainstorm ideas for encouraging all of our kids to become eager and proficient readers. Our two events—Celebrating Heroines in Fact and Fiction and How to Get and Keep Boys Reading—presented diverse groups of book creators discussing their own work, as well as books by many other authors, in dynamic conversations regarding how authors, illustrators, and all adults who live and work with young people can create and empower life-long readers who choose to read beyond perceived gender barriers and their own comfort zones to ultimately explore an unlimited range of characters, experiences, plots, and topics. 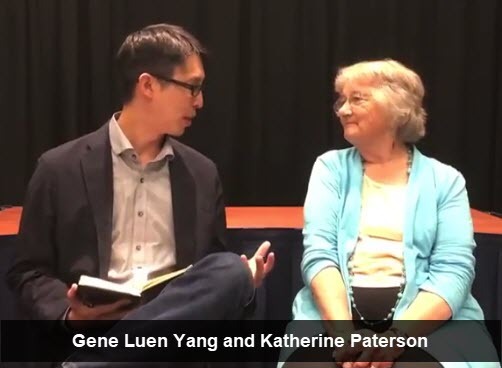 We invite you to watch the event videos and hear what all of the participating authors and illustrators have to say about getting and keeping both girls and boys reading and reading widely. We also encourage you to browse our extensive, complementary education resources, which we hope will inspire you to share the literary and artistic work of all the participating authors and illustrators in your classroom, library, and home. Acclaimed authors for young people KATHERINE PATERSON, RITA WILLIAMS-GARCIA, JEANNINE ATKINS, and HEATHER LANG and award-winning illustrator EKUA HOLMES gathered at An Unlikely Story Bookstore & Cafe in Plainville, Massachusetts on May 4, 2017 for the NCBLA panel discussion Celebrating Heroines in Fact and Fiction. This panel discussion, created especially for teachers, librarians, and parents, was created to highlight the literary and artistic work of this extraordinary panel that is of special interest to girls and young women, work that celebrates heroines in fact and fiction. Discussion topics ranged from the characteristics of a heroine, to how authors choose what to write, to how to encourage boys and girls to read all kinds of books. Librarian Grace Worcester Greene moderated the discussion. In photograph, left to right: Grace Worcester Greene, Jeannine Atkins, Heather Lang, Ekua Holmes, Katherine Paterson, and Rita Williams-Garcia. Photo by Richard Groth. • To read more about each of the event participants, click here. • To watch the event videos, click here. 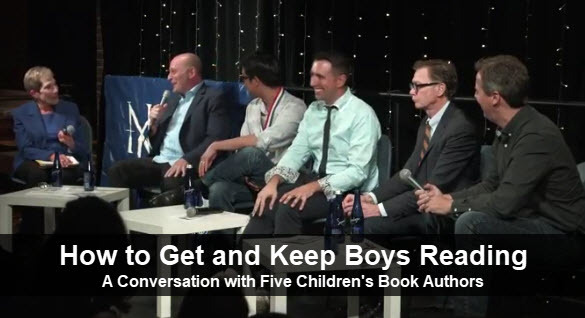 Renowned authors and illustrators for young people JACK GANTOS, JEFF KINNEY, JARRETT J. KROSOCZKA, JON SCIESZKA, and the Library of Congress National Ambassador for Young People’s Literature GENE LUEN YANG gathered on Thursday, October 5, 2017 for How to Get and Keep Boys Reading. Our lively panel of authors and illustrators, whose work is of special interest to boys, participated in an informative and entertaining discussion on how to get and keep boys reading. 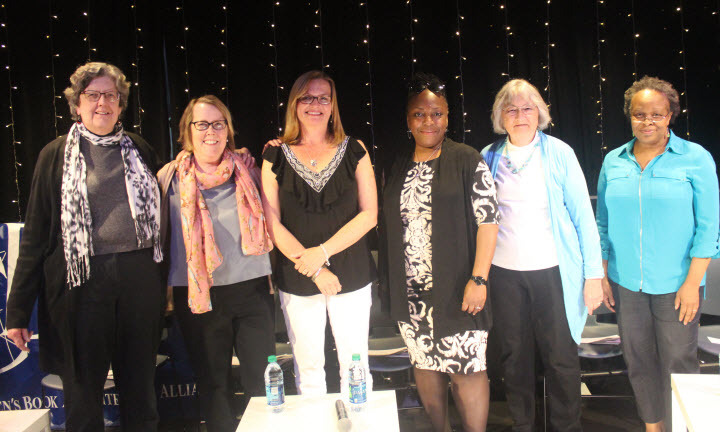 The panelists addressed a wide range of topics, including how to inspire boys to read and write, each author’s own sources of inspiration, the impact of visuals on books, and how to encourage life-long reading. Librarian and Children’s Literature expert Maria Salvadore moderated the discussion. 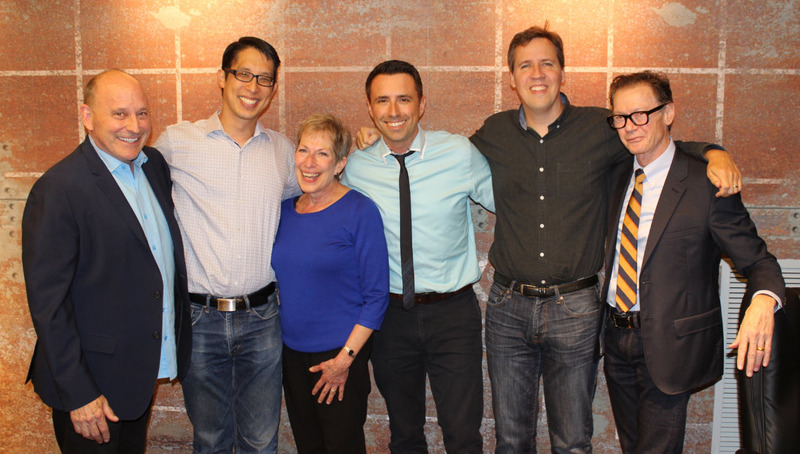 In photograph, left to right: Jon Scieszka, Gene Luen Yang, Maria Salvadore, Jarrett J. Krosoczka, Jeff Kinney, and Jack Gantos. Photograph by Richard Groth. 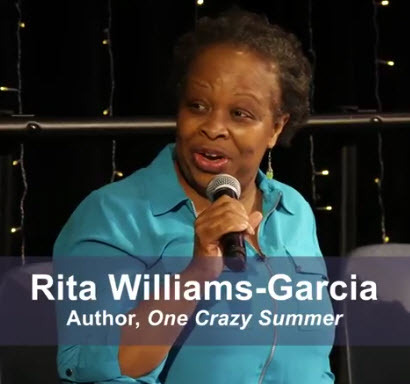 The National Children’s Book and Literacy Alliance partnered with An Unlikely Story Bookstore & Cafe and WETA Public Television/Reading Rockets to plan and orchestrate these two author events. The professionals at Reading Rockets filmed, edited, and published videos from both Celebrating Heroines in Fact and Fiction and How to Get and Keep Boys Reading. Both event videos have been conveniently separated into thematic segments. Please check out all the video links below! The following education guides, articles, blog posts, and videos expand and complement the content of both the Celebrating Heroines in Fact and Fiction and How to Get and Keep Boys Reading event videos. The following education resource guides include discussion questions and activities for use in your classroom, library, or home. Guides are listed in alphabetical order by each author’s and illustrator’s last name. We encourage you to print these guides and store them in binders for quick access. Each NCBLA education guide is formatted to be easily printed double sided. Education Resource Guide for Atkins’ nonfiction book Finding Wonder: Three Girls Who Changed Science, including discussion questions, science activities, and art exploration exercises. Education Resource Guide for Gantos’ Writing Radar: Using Your Journal to Snoop Out and Craft Great Stories, including discussion questions, writing exercises, and general writing education tips. Discussion Guide and Teachers’ Guide (complete with Common Core Connections) for Voice of Freedom: Fannie Lou Hamer created by Candlewick Press. Education Resource Guide for Kinney’s Diary of a Wimpy Kid: The Long Haul, which includes discussion questions, interdisciplinary activities regarding topics relevant to the book (the Spanish language, state fairs, and heat expansion), a list of books for further reading, and other resources regarding graphic novels. Education Resource Guide for Krosoczka’s Star Wars Jedi Academy: A New Class, which includes discussion questions, classroom activities, and links to online resources regarding graphic novels and comic books. Classroom discussion and activity guides for Lang’s books: Swimming with Sharks, Fearless Flyer, Queen of the Track, and The Original Cowgirl. Education Resource Guide for Katherine Paterson featuring materials regarding The Great Gilly Hopkins and The Same Stuff as Stars. Education Resource Guide for Scieszka’s Knucklehead, including discussion questions, writing exercises, and general writing education tips. Education Resource Guide for Williams-Garcia’s novel P.S. Be Eleven, which includes discussion questions, interdisciplinary activities regarding topics relevant to the book (Motown, Vietnam War, and Senator Robert F. Kennedy), and a list of books for further reading. Education Resource Guide for Yang’s Secret Coders graphic novel series, including discussion questions, a reading activity, cartooning activity, cartoon lesson plans, and graphic novel booklists. 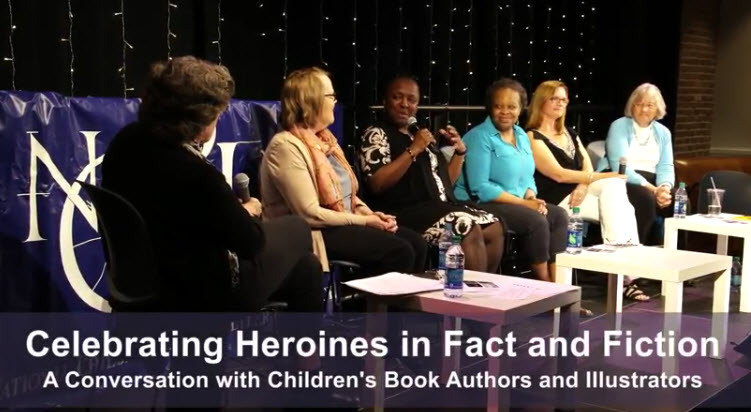 Check out this extensive bibliography of picture books, fiction, nonfiction, and websites featuring strong female characters compiled by librarian Grace Worcester Greene and the Celebrating Heroines panel of participating children’s book creators. Graphic novels and comic books can appeal to even the most reluctant reader. Visit our Graphic Novels and Comic Book Resources page to discover a treasure trove of resources—articles, websites, and booklists—to help you make the most of graphic novels and comic books in the classroom, library, and at home. Be sure to watch the following selection of video interviews with many of the event participants and share them with the young people in your life. The Girls Read | Guys Read logo was created by Christopher Eddins.